Panasonic Idemitsu OLED Lighting (PIOL) unveiled new OLED lighting panels and also revealed the company's roadmap till 2018. The company currently produces 100x100 mm panels, and they are now showing new 150x50 mm and 200x50 mm panels that will be released in the spring of 2013. The new panels will offer the same performance as PIOL's current panels: 10,000 lifetime (LT70), 30 lm/W and color temperatures of 3000K, 4000K and 5000K. PIOL confirmed that the only difference to the current panels is the shape. PIOL's panels have a high CRI (over 90) and they mostly target museums and exhibitions (some of the panels have already been used in at least two museums: Kyoto's MOMAK museum and Panasonic's own Shiodome museum). Rohm has unveiled a new planar LED (not OLED) lighting panel. The panel is made by using LED packages on a plane surface and a light diffusion plate which makes it seem like a planar device - like an OLED lighting panel. It has a very high CRI (98) - achieved by using a white resin layer on the package which prevents the sulfuration of the lead frame. Rohm says that the panel is superior to OLED panels - in terms of cost and efficiency (the life time is also very good at 50,000 hours). Of course OLED lighting is still a new technology which improves rapidly - and will offer features that will be hard to achieve using LEDs (transparency, flexibility, low-cost printing processes, etc). Rohm haven't yet decided when to commercialize this panel, but they say that the technologies needed are "almost completed". Israeli's Oree is already producing similar LED panels. Panasonic announced they will soon release two new OLED lighting panels (and modules). The new panels will feature daylight white (5000K) and natural white (4000K) and will complement the already available bulb-color (3000K) panels). The panels, made by Panasonic Idemitsu OLED Lighting (PIOL) are already shipping and the modules (which include a built-in control circuit) will ship in August. The panels feature a CRI of over 90, a lifetime of 10,000 hours (LT70) and an efficiency if 26-30 lm/W. They are 2 mm thick. The panels luminance: 2,600 cd/m² (5000K), 2800cd/m² (4000K), 3000cd/m² (3000K). 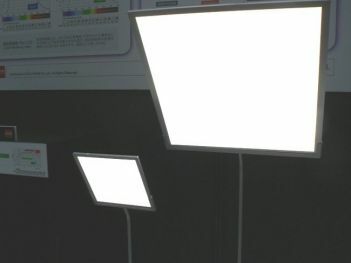 First-O-Lite has sent us an update regarding their OLED lighting R&D progress. The company have successfully developed a hybrid tandem WOLED lighting device, which features 77.2 lm/W and a CRI of 87.2 (@2090 cd/m2). The CIE is (0.46, 0.42). The company's Gen-1 production line will be able to produce samples by the end of the year. They are also developing a Gen-2 production line (in a $40 million investment) that will be able to produce "large sized" panels by early 2013. The plan is to use the Gen-2 fab to make small-scale production for early market development. 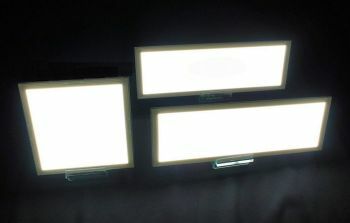 The Fraunhofer Institute first announced their Tabola OLED lighting panels back in October 2010, with plans to release them in Q1 2011. We haven't heard anything since (and I assumed the project was scrapped) - but last week I got a nice surprise in the mail: three sample panels (two transparent, one structured). The Fraunhofer are now producing sample panels and have actually started to ship these cool transparent Tabola OLEDs to customers now - which makes these the first transparent OLED lighting panels on the market. Read on for our hands-on review. The downside of the decorative panels is the efficiency: In 2015 these panels will offer only 15 lm/W (that's only marginally better than an incandescent lamp). By 2018, those large flexible panels will offer 35 lm/W - which is still very low (Fluorescent lamps today offer 70-100 lm/W). Researchers from Dresden's University of Technology (TU Dresden) developed new highly efficient white top-emitting OLED design that feature "outstanding" color quality, and is compatible with flexible OLEDs. In this new design a refractive index matched microlens film was laminated to the top-emitting OLED to form direct optical contact. This enabled the researchers to achieve a CRI of 93, CIE coordinates of (0.472, 0.430) and an emission from 410 to 750 nm that almost spans the complete visible spectrum (380 to 780 nm). The efficiency is up to 30 lm/W (on par with the latest record white OLEDs from Novaled and OSRAM). The lamination of such an outcoupling structure should be fully roll-to-roll compatible and even allows to be used as an encapsulation film when water and oxygen barriers are added. 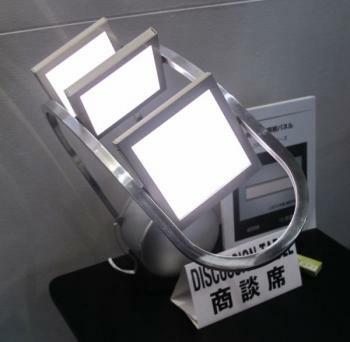 Panasonic Electric Works announced that they developed a new highly efficient OLED device - featuring 128 lm/W efficiency. This was achieved using a semi-spherical highly-refractive lens to enhance light extraction. The OLED panel is small - only 2x2 mm, and according to Panasonic this is the world's most efficient white OLED. PEW says that in order to achieve this high efficiency, they inserted a light extraction layer composed of a highly-refractive material between the emissive layer (EML) and the glass substrate. The back side uses a high-reflectivity metal material. Detailed calculations were performed to minimize the internal reflection - this doubled the light extraction efficiency to 40%. This panel uses all-phosphorescent materials, and PEW says that this technique is actually similar to the technique used by Universal Display when they developed the 102 lm/W device back in 2008.